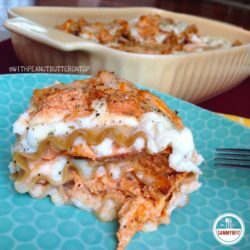 Buffalo Chicken Lasagna Rolls – this recipe combines wonderful things here: buffalo chicken, lasagna and cauliflower ‘alfredo’ sauce. Bet you would never have thought of that being a wonderful trio party in your mouth! Although roll-ups are more work than the traditional layered lasagna, they are a great way to have a perfectly portioned serving. We all know that we cut more than a healthy serving when it comes to lasagna. Or cake. Or a loaf of your favorite banana bread. Admit it. Take a break from your traditional lasagna rollups and give these Buffalo Chicken Lasagna Rolls a try. These rolls are filled with delicious buffalo chicken, mozzarella cheese, and a wonderful alfredo sauce made from a head of cauliflower! Yes, you read that right! Made with my Creamy Cauliflower Alfredo Sauce. 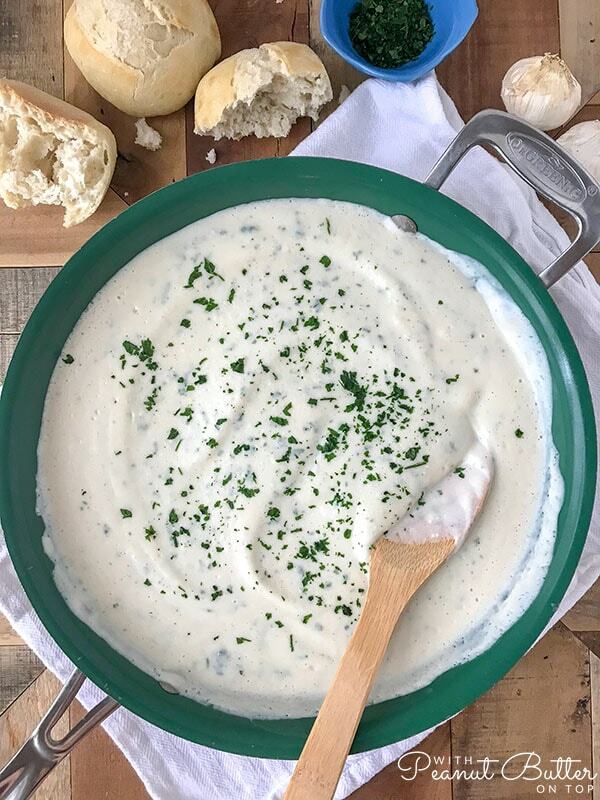 Not to toot my own horn, but if you’re an alfredo sauce lover, then you will love this rendition. Not only because it’s healthier for you, but it tastes just like the original! Best part? Lower calories, lower fat, lower everything. Just not low on the flavor! Feel free to make a large batch, freeze the leftovers and save them for a rainy/chilly day. Buffalo Chicken Lasagna Rolls - this recipe combines wonderful things here: buffalo chicken, lasagna and cauliflower 'alfredo' sauce. Bet you would never have thought of that being a wonderful trio party in your mouth! Place a nonstick pan over medium heat. Place the chicken breasts into a large ziploc bag and combine with the seasonings. Toss the bag around a bit to help mix the seasonings throughout. Once the pan has heated, spray with nonstick cooking spray and add the chicken. Cover and allow to cook, checking every 3-4 minutes to flip. Cook until cooked through. Remove from heat and allow to cool. While the chicken is cooking, place a large pot of water and a medium pot of water over high heat and bring them both to a boil. To the medium pot, add the cauliflower florets. To the large pot, add the lasagna one at a time, stirring. Allow the lasagna to cook for 4-5 minutes, strain and lay out flat on paper towels or a dish towel to dry a bit. Allow the cauliflower to cook 5-7 minutes or until it has softened. Strain the cauliflower very well, saving the water, and add the cauliflower to a food processor or blender. Add the remaining ingredients (minus the cheese) and process until it reaches a creamy consistency. Add the water from the cauliflower to the processed sauce to reach desired creaminess. This is completely optional and depends on how thick or thin you prefer your sauce. Add the mozzarella cheese, stirring with a spoon to incorporate. Preheat the oven to 350 degrees F. Spray a medium baking dish with nonstick spray and layer the bottom of the dish with 1/2 cup of the sauce. Using two forks, shred the now cooled chicken breasts. Once shredded, combine with the remaining ingredients for the buffalo mixture. When spreading and adding toppings, add more towards the middle and less towards the end. When you roll, the ingredients will want to push towards the edges. Roll each lasagna and place them into the baking dish. Top the lasagna rolls with the remaining sauce, buffalo chicken and cheese. Bake for 25-27 minutes. Remove from the oven, sprinkle with a dash of black pepper and basil. Enjoy! Not into rolling it? Layer it like a regular lasagna and bake!